Europe’s Interreg 2 Seas Programme has awarded €5.6 million to the MET-CERTIFIED project to accelerate the deployment of marine energy projects. MET-CERTIFIED is run by a consortium of European industrial, governmental and academic partners. In July 2016, the Interreg 2 Seas Monitoring Committee gave the green light to the MET-CERTIFIED project which aims to increase the adoption of insurable and bankable marine energy projects through the development of internationally recognised standards and certification schemes for marine energy technologies. The technologies will be tested and verified against International Electrotechnical Commission (IEC) standards for marine energy convertors. “This project answers one of the main recommendations from the Ocean Energy Forum Strategic Roadmap,” says Peter Scheijgrond, project manager of the MET-CERTIFIED project. “Certification can help to reduce perceived risks of the technologies in terms of performance and structural integrity, and thus helps to attract debt financing and make export much easier. At present no certification schemes for marine energy have been developed and implemented by all main stakeholders in a consistent way. The expectation is that it will come into existence over the next three years under the umbrella of the IEC. Therefore the timing of MET-CERTIFIED is very favourable. “With the funding we can actively involve stakeholders around certification, from banks and insurers to consenting authorities, end-users, test facilities and classification bureaus. We will start with verifying existing pilot projects against the IEC standards. 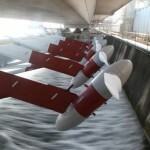 For example the tidal power plant in the Eastern Scheldt Storm Surge barrier will be used as a reference case for certification. By applying the standards and certification schemes on such projects we will receive valuable feedback to improve the IEC products. Next we will go through the process of certification: from concept to construction to installation of a full-scale floating platform for tidal turbines. Belgium: The Regional Development Agency West Flanders and Ghent University. EMEC’s specific role in this project focuses on leading a work package on testing and certification. Working with DNV GL, Lloyds Register and the Tidal Testing Centre, EMEC will help develop testing and verification methodologies and apply them to existing pilot test programmes. 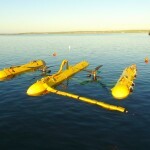 The pilots include inshore tidal turbines (Tocardo) and a submerged platform (Sustainable Marine Energy). MET-CERTIFIED is receiving funding from the Interreg 2 Seas programme 2014-2020, co-funded by the European Regional Development Fund under subsidy contract No 2S01-020. The Ministry of Economic Affairs in the Netherlands, the provinces of South and North Holland and the Belgian Province of West Flanders are also offering financial support towards the project. Interreg 2 Seas is a European Territorial Cooperation Programme covering the UK, France, the Netherlands and Belgium (Flanders). The Programme is part-financed by the European Regional Development Fund and has a total of €241m ERDF to co-finance projects in the 2014 – 2020 period. The overall objective is to develop an innovative, knowledge and research based, sustainable and inclusive 2 Seas area, where natural resources are protected and the green economy is promoted. To realise this, projects that directly contribute to one of the specific objectives (such as “Low Carbon Technologies”) can be part-financed for up to 60% of their total project budget.